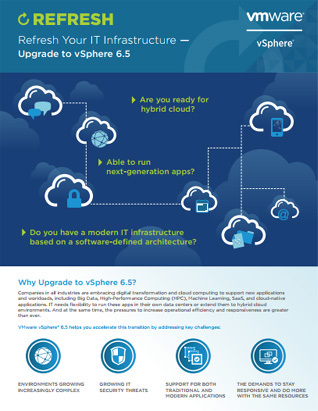 Why Upgrade to vSphere 6.5? Companies in all industries are embracing digital transformation and cloud computing to support new applications and workloads, including Big Data, High-Performance Computing (HPC), Machine Learning, SaaS, and cloud-native applications. IT needs flexibility to run these apps in their own data centers or extend them to hybrid cloud environments. And at the same time, the pressures to increase operational efficiency and responsiveness are greater than ever.